In Winter 2018, Dr. Anthony Seraphin (MATH) and Dr. Steven Hastings (APEC) will be Co-directing a trip to Dominica, one of the most southern islands in the Caribbean. The courses that will be offered are GEOG 235 and APEC 150. If you have had either of these courses, a 3-credit Independent Study can be arranged. This trip is open to all majors. This is the third Study Abroad trip to Dominica for Dr. Seraphin and second for Dr. Hastings. Dominica is tropical and a very nice place to visit in January! Details, deadlines, interest meeting re the trip can be seen at http://international.udel.edu/DB/PUB_Program.aspx?Pgm=2160. The next Interest meeting is Monday, March 20 at 5:00 pm in Room 116, Gore Hall. A blog, compiled by Dr. Hastings and the students, detailing the 2012 trip can be seen at: https://dominica2012.wordpress.com/. Questions: please contact Dr. Hastings (hastings@udel.edu) or Dr. Seraphin (seraphin@udel.edu). Study beef cattle, sheep, and dairy cattle, horses and sustainable farm management, and current issues facing agriculture and the environment. New Zealand is a spectacular country full of beautiful scenery, friendly people and innovative farmers. New Zealand is also one of the most agriculturally diverse and efficient countries in the world. Students will also enjoy the natural beauty and animals (domestic and wild) of the Canterbury Plains, Southern Alps, glaciers, mountain lakes, and temperate rain forest. 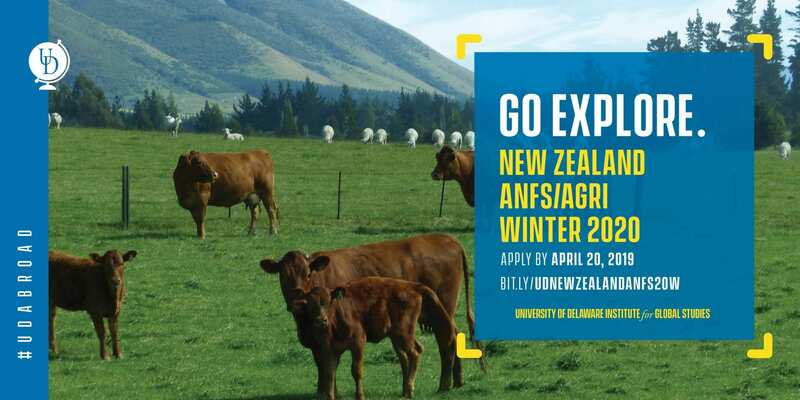 Based at Lincoln University on the South Island of New Zealand, just outside of the city of Christchurch on the Canterbury Plains, you’ll meet farmers, entrepreneurs and agricultural professionals as you study current issues facing the agricultural industry and pastoral livestock production. In addition you will learn about the history and settlement of New Zealand, one of the younger countries of the world and Maori culture (the native Pacific Islanders of New Zealand) through excursions to historic stations, modern farms, the Canterbury Museum, and The International Antarctic Centre. In Winter 2017, Dr. Anthony Seraphin (MATH) and Dr. Steven Hastings (APEC) will be Co-directing a trip to Dominica, one of the most southern islands in the Caribbean. The courses that will be offered are STAT 200 and APEC 150. If you have had either of these courses, a 3-credit APEC 367 Independent Study can be arranged. This trip is open to all majors. Details, deadlines, interest meeting re the trip can be seen at http://international.udel.edu/DB/PUB_Program.aspx?Pgm=1936. Did you know that you can study in Morocco, China, Dominica, India, Brazil, England, Costa Rica, or in a host of other countries while fulfilling your requirements towards graduation? With over 70 programs in more than 35 subjects in over 30 countries, the University of Delaware has a program that suits your interests, schedule, and academic needs. Take a minute to browse our website (www.udel.edu/global/studyabroad ), where you’ll find detailed information about all of our programs, as well as an on-line application. While browsing, check out some of the newly-approved winter 2017 programs designed specifically for students in your college: Costa Rica/Panama ENWC, New Zealand PLSC/CIEG, Spain ANFS, and Dominica APEC. Several summer programs are still accepting applications, and semester programs in Barcelona, Sydney, London, Prague, and other locales, are slated for the fall and spring. For students interested in a full immersion experience, exchange opportunities exist as well. Be sure to check with your advisor to find out which programs would best meet your curricular needs. Come learn more about each individual program at an interest meeting. Check our website for a full list of meeting dates, times, and places, with new ones to be added as the fall semester begins: http://international.udel.edu/DB/PUB_InterestMeetings.aspx . Want to learn more about how to finance study abroad? Come to a financial aid information session on March 1 or March 16, from 3:30 to 4:30 pm in Kent Dining Hall. If you have any questions, please feel free to stop by our office in Elliott Hall (26 East Main Street), drop us an e-mail (studyabroad@udel.edu), or give us a call (302-831-2852). If you want to meet with a study abroad advisor, come by during advising hours on Wednesdays from 1:00-3:00. While browsing, check out some of the winter 2016 programs that are still open and accepting applications from students in all majors: Costa Rica, Brazil, India, Trinidad, London, Italy, Germany, and many more. Summer 2016 programs include locations such as Belgium, Ireland, Italy, Japan, Spain, and England, and internships in Spain and New Zealand are available as well. Semester programs in Copenhagen, Rome, Barcelona, Sydney, and Tuscany (Italy), with no language prerequisite, are slated for spring 2016, and a new Prague program with courses in English is open for fall 2016. Want to learn more about how to finance study abroad? Come to a financial aid information session on Thursday, September 10, from 3:30 to 4:30 pm in 102 McDowell Hall. ALL applicants will automatically be considered for both need- and merit-based study abroad scholarships. No extra application is necessary! If you have any questions, please feel free to stop by our office in Elliott Hall (26 East Main Street), drop us an e-mail (studyabroad@udel.edu), or give us a call (302-831-2852). If you want to meet with a study abroad adviser, come by during advising hours on Wednesdays from 1:00-3:00.